Beal's research explores the history of American experimental music. Her teaching interests include historical surveys, performance practice seminars, twentieth-century and American music. As a performer she remains active as a pianist and as director of the Experimental Music Ensemble. She is particularly interested in the performance and reception of contemporary music, and in working with groups that include both musicians and non-musicians. Her recent research explores the underrepresentation of women composers in histories of American music. 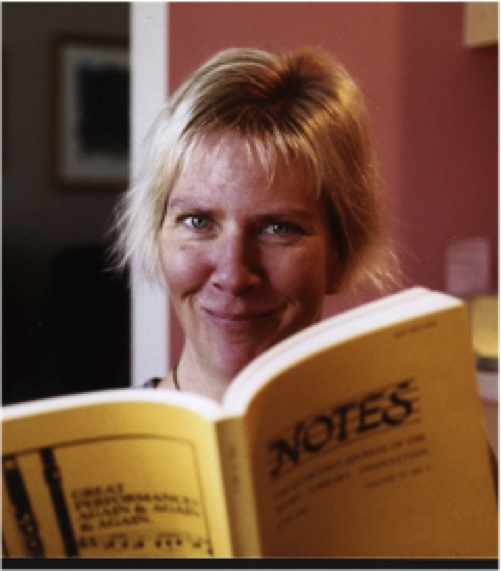 Johanna Beyer (University of Illinois Press, American Composers Series; February 2015). Carla Bley (University of Illinois Press, American Composers Series; 2011). New Music, New Allies—American Experimental Music in West Germany from the Zero Hour to Reunification (California Studies in Twentieth-Century Music, University of California Press, 2006). "Living in the (Publishing) House of Music: A Short History of Composer-Driven Publication and Distribution in the U.S.," Rethinking American Music, Tara Browner and Thomas Riis, eds. (University of Illinois Press, forthcoming). “Musica Elettronica Viva and the Art Ensemble of Chicago: Tradition and Improvisation in Self-Exile ca. 1970,” Crosscurrents: American and European Music in Interaction, 1900-2000 (Basel: Paul Sacher Fundation, 2014): 364-371. “Christian Wolff in Darmstadt, 1972 and 1974,” in Changing the System: The Music of Christian Wolff, edited by Philip Thomas and Stephen Chase (Ashgate, 2010). “Music is a Universal Human Right: Musica Elettronica Viva,” Sound Commitments: Avant-garde Music and the Sixties, Robert Adlington, ed. (Oxford University Press, 2009): 99-120. “Time Canvasses: Morton Feldman and the Painters of the New York School,” in Modern Art and Music (Border Crossings). James Leggio, ed. (New York: Routledge Publishing, 2002), 227-245. "Why We Sing: David Mahler's Communities," Journal of the Society for American Music, Vol. 7, No 1 (2013): 1-28. “Her Whimsy and Originality Really Amount To Genius: New Biographical Research on Johanna Beyer,” American Music Review Vol. 38, No. 1 (fall 2008; formerly The Institute for Studies in American Music Newsletter): 1, 4-5, 12-13. “Experimentalists and Independents are Favored—Mapping Americana: John Edmunds in Conversation with Peter Yates and John Cage, 1959-61,” Notes: Quarterly Journal of the Music Library Association 64/4 (June 2008): 659-87. “Politics and Protest in American Musical History,” Music and Politics (online journal), volume 3 (January 2008). “An Interview with Earle Brown,” Contemporary Music Review 26/3-4 (June/August 2007): 341-56. “David Tudor in Darmstadt,” Contemporary Music Review 26/1 (February 2007): 77-88. “The Army, the Airwaves, and the Avant-Garde: American Classical Music in Postwar West Germany,” American Music Volume 21, No. 4 (winter 2003): 474-513. “A Place to Ply Their Wares With Dignity: American Composer-Performers in West Germany, 1972,” Musical Quarterly Volume 86, No. 2 (summer 2002): 327-346. "Six Primes," Chris Brown, Six Primes (New World Records, July 2016), 2-12. "A Distant Music: The Office Next Door," Paul Nauert, A Distant Music(New World Records, June 2015), 2-12. "The Awesome Unflappability of Joseph Kubera," Book of Horizons: Joseph Kubera, Piano(New World Records, 2014). "Downtown's Flexible Son: Daniel Goode and Total Overload," Daniel Goode: Annbling (New World Records, 2014). "Single Side Only: Size Matters, But One Page is All You Need," Underwater Princess Waltz: A Collection of One-Page Pieces. Recordings by Zwerm (New World Records, 2013). "Trio: Dong, Polansky, Wolff" (Henceforth Records, 2012). “A Short Stop Along the Way: Each-Thingness and Music for Merce,” Music for the Merce Cunningham Dance Company (1952-2009) (New World Records, 2010). “Timeless Pulse: A Few Thoughts.” Timeless Pulse Trio: Pauline Oliveros, George Marsh, Jennifer Wilsey Marsh (Taiga Records, 2010). “Why We Sing: David Mahler’s Piano Music” (New World Records, 2010). “Dreaming of Virtuosity”: Michael Byron, Dreamers of Pearl (New World Records, 2008). “Nature is the Best Dictator—Twentieth-Century American Violin Music,” Works for Violin by Miwako Abe and Michael Kieran Harvey (New World Records. 2006). Settling Scores: German Music, Denazification and the Americans, 1945-1953, by David Monod (Chapel Hill: University of North Carolina Press, 2005); in American Studies 48/2 (summer 2008). CageTalk: Dialogues With and About John Cage, Peter Dickinson, ed. (University of Rochester Press, 2006); in twentieth-century music 5/1 (July 2008). 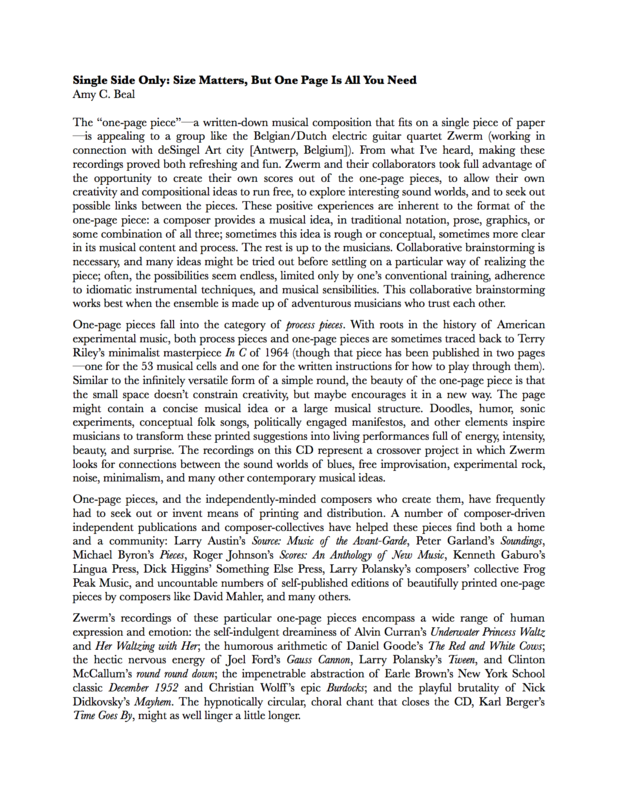 Writings through John Cage's Music, Poetry, and Art, edited by David W. Bernstein and Christopher Hatch (Chicago : University of Chicago Press, 2001), book review in Notes: Quarterly Journal of the Music Library Association (winter 2002): 337-339. Perspectives on American Music, 1900-1950. Michael Saffle, ed. (New York: Garland Publishing, Inc., 2000), book review in Notes: Quarterly Journal of the Music Library Association 58/1 (September 2001): 101-103. The Music of Morton Feldman (1996) edited by Thomas DeLio, book review in The Sonneck Society for American Music Bulletin (Spring 1998): 23. 2001: American Musicological Society, Alfred Einstein Award for article "Negotiating Cultural Allies: American Music in Darmstadt 1946-56," Journal of the American Musicological Society 53 (2000). 1999: Society for American Music, Wiley Housewright Dissertation Award, "Patronage and Reception History of American Experimental Music in West Germany, 1945-86," University of Michigan, 1999.